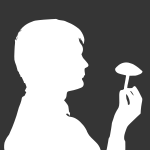 Unable to collect a spore print so far. looking at the base of the gills, the spores MAY be black but that only speculation. A couple of things seem to point away from Coprinellus. First, the caps appear to not have radial/marginal striations. Also, a few of the these show fairly persistent remnants of a partial veil clinging to the cap margin and/or stalk. C. micaceus types have a very insubstantial partial veil --if at all-- consisting of a few thin threads that quickly disappear. I haven't thought of a Coprinopsis species that looks like these; and I don't see any sign of deliquescence (inkiness) on the gills/cap. My guess is these are a species of Psathyrella. Coprinus/Coprinellus species have pure black spore prints. Psathyrella have dark purplish brown prints --mostly; it's a large genus. To see the difference between a very dark Psathyrella print and a black print from an inky-cap, it may be necessary to view a thick print deposited on a pure black non-porous surface (by way of contrast with black or absence thereof). Panaeolus species also have black spore print (and do not deliquesce), but these don't look like Panaeolus to me.